This post could also be titled I Need A Girls Day! Big sigh…and so the story begins…. We have been working hard to remodel our living room. We painted the walls and tore out the carpet and now it resembles a cabin. A man cave. The walls have photos of hunting and football hanging on them. It really does look great. The floor was uneven so my husband to take the snap in place floors up, sand the floor down a little and add some floor concrete something or another to make it more even. The sanding caused the house to be covered in dust. As in, nasty, thick icky awful dust. The. Entire, House. But the living room looks amazing. And, yes, I took photos to document it being clean. It was about to get crazier. The Cabela‘s catalog arrived in the mail. Suddenly, I find myself debating over whether we would get a camouflage toilet seat and a bone collector shower curtain – in our only bathroom. And I think, “How does this happen?” because it looks like it just MIGHT happen. As the conversation after dinner dwindled on this subject, S1 grabbed the pot of chicken scraps and headed out to the chicken coop for our four chickens that have survived the raccoon massacre last summer. Jake and I were chatting when the door burst open and slammed against the cabinet I hold all my glass things on – nothing dropped. “PossumInTheChickenCoopGetThe22,” he rushed in one breath. S1 and Jake quickly loaded up their guns and ran outside. Here is how S1 tells the story…. I would not let the opossums come into the house. They left the nasty, sharp teethed varmints in the snow beside the kitchen door. The next morning, the other boys had to check them out. S3 tentatively was checking to see if they were dead and S4 hissed, making S3 jump back and the other brothers double over in laughter. The boys asked if we could have the possums for dinner that night. “This is nastier. No,” I answered. At work, Jake called and teased we should have some for dinner. “No!” I answered determinedly. Friends stopped in and asked me seriously, SERIOUSLY, if I was going to cook them up for supper. The boys rolled their eyes at me and sighed dejectedly. “Mama won’t let us,” the moaned. What a mean Mama I am. I posted this on facebook…. These are words I never thought I would say. No. No, I do not want to. Someone, someone save me!!! You all keep me here and I keep posting these stories for you but really, I could use tea at Downton Abbey and all that formality to help balance this all out. Yup. This made the heebee jee bees worse. ACK! 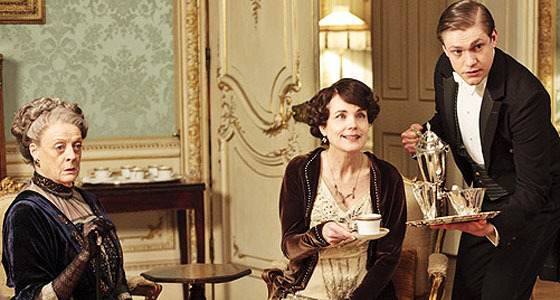 Downton Abby is not frilly enough. You need a full on pink ruffled, laced, tulled shock to the system girl! Thanks for sharing your life. I agree, you need a girls weekend though and not just one day. I too have 4 boys and have to work hard to keep some assemblence that there is in fact a female living in my house. You are very brave for eating road kill and I agree, you should not eat opossum for dinner or any other meal. EW. OH MY! We live in the SAME world of BOYS!!!!!! I could have written that post!! My only help is that I have ONE girl…. and though we don’t come even close to balancing the boyness of our world at least we can try together!! LOVED the post and the living room does look great!